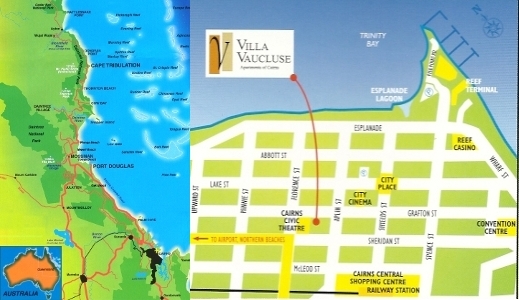 Villa Vaucluse, Apartments of Cairns is located at 141 Grafton Street, right in Cairns' inner city so your accommodation is just seconds away from shopping, restaurants, entertainment, culture and business. Villa Vaucluse, Apartments of Cairns situated in the vibrant city of Cairns, the heart of Tropical North Queensland provides you the ideal base from which to explore in all directions. Villa Vaucluse, Apartments of Cairns, is on the Tropical North Coast of Queensland and is the perfect central accommodation base for tourism destinations taking you to The Great Barrier Reef to cruise, snorkel or dive, photograph corals and marine fish, or just relax on secluded island beaches. Being also the home of the Heritage Listed Daintree National Rainforest, Villa Vaucluse, Apartments of Cairns can only offer you access to some of the most breath taking sights the world has.